"Before You" -- Myra (This is a new aria added for the New York City Opera production). All the production photos here are from the world premiere production by Opera Santa Barbara in 2009, set design by Heidi Ettinger, photos by David Bazemore. Séance ON A WET AFTERNOON is a psychological thriller about a medium, Myra Foster, her doting husband Bill, and the spirit of their deceased eleven-year-old son, Arthur, who speaks to Myra and is her contact for her Séances. Because Myra has never received the recognition she feels her gifts merit, they hatch a Plan: They will kidnap the daughter of a local wealthy industrialist, and keep her safe while the media frenzy over her abduction builds. When Myra has a "vision" that leads to the successful recovery of the girl and the ransom, her fame will be assured. As The Plan is put into action, the girl's presence in the house leads to complex psychological responses from Myra, Bill, and Arthur. The delicate balance of Myra and Bill's relationship and Myra's sanity itself begins to fray, as long-buried secrets are revealed. The Plan goes badly awry, and in Myra's final Séance, the drama comes to a devastating conclusion. Here are my notes and a few thoughts about meaning. 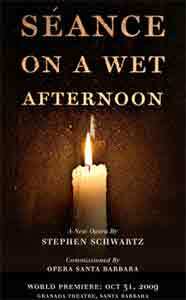 I'm Carol de Giere, author of the Stephen Schwartz biography, Defying Gravity (opens in new browser window). My husband and I traveled to Santa Barbara, CA to see the world premiere of Schwartz's Seance on a Wet Afternoon. You'll want to enjoy some of the surprises of the opera, so I won't spoil them for you. Seance on a Wet Afternoon began as a novel by Mark McShane before Bryan Forbes created the chilling psychological thriller film (1964). To write the opera, composer-librettist Stephen Schwartz returned to the novel to re-explore the storytelling potential. [link to Seance on a Wet Afternoon novel ] He also drew from the film and his own vision of possibilities. [link to movie Seance on a Wet Afternoon DVD]. Originally set in London, Schwartz changed the location to one of San Francisco's Victorian homes. (He stayed in such a house in 1976 when he was working on a problematic show, The Baker's Wife . See the photo to the left for a view of the house on the opera set). He also changed some of the names and plot outcomes. The core story revolves around Myra Foster (Myra Savage in the film), a self-styled psychic who longs to be recognized for her "gifts." Equally important to the themes developed here is her relationship with her devoted but weak-willed husband, Bill Foster. We learn early of Myra's perceived need for public recognition of her talent. We also get a glimpse on her deluded psychological state when she expresses her plan to have Billy "borrow" (a euphamism for kidnap) the young daughter of a well-to-do couple, leaving an ransome note. They will keep the girl locked away in an upstairs bedroom of their home, which they will set up to appear as a hospital room. Myra envisons her future fame when her spiritualist "vision" leads to the successful recovery of the girl. 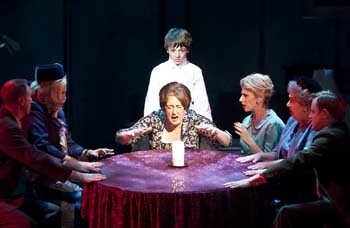 In Act I, after "First Séance" is performed by Myra and Séance attendees, Myra and Bill sing of the justification for their actions in "One Little Lie." As the opera unfolds, so does the backstory. Myra and Bill have previously lost a child, Arthur, who, after death, supposedly becomes Myras link to the other side. She partly justifies her talent as a psychic medium on her connection to Arthur. Is the connection a manifestation of motherly grief or real ability? We don't know. In the film, Arthur was stillborn. As the Variety reviewer notes, the film makes "much macabre reference to a son" who we never see. Another reviewer asserts,"Had Arthur manifested himself in a more concrete way than Myra's warblings, the film would have been spooky." 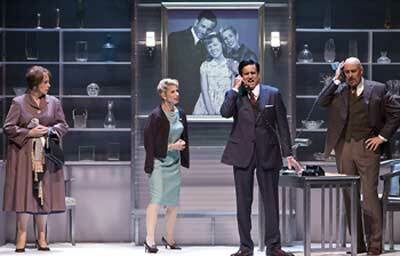 Following a duet by Myra and Arthur, "It's Always Been True," the story moves into the Clayton's lives. Disrupted by the kidnaping and ransome note. Mr. and Mrs. Clayton sing of their daughter in one of Schwartz's most powerful duets of his career, "Adriana." Soon the Foster's diabolical abduction plan for "Adriana" starts to fall apart. We witness Myra's delusions worsening. She ponders a change of plan for the kidnapped girl based on her conversations with Arthur. Bill is seemingly trapped, tied as he was to his wife's world by his supportive or needy behavior. In Act II, the plot evolves somewhat differently than the movie. 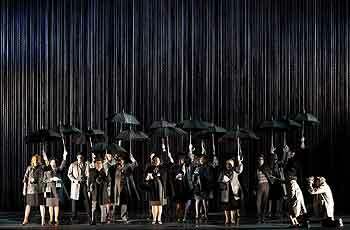 It's not a comic opera, but rather is in the tragic opera tradition. I agree with the LA Times reviewer who wrote: "A strange – and strangely moving – tale … with an ultimately comforting charm, despite its wicked plot turns. Schwartz commands a sure skill with a tune and the arc of a dramatic evening." "Séance on a Wet Afternoon" is the story of Myra Foster, a professional medium who goes to desperate lengths to gain recognition for her supernatural gift, the ability to communicate with the dead. This opera explores the extraordinary capacity of love, its paradoxical ability both to save and to destroy. It asks questions about the nature of our natural existence and touches on the possibility of the supernatural: Can love reach across the veil of death? Is there another world, a place of spirits that lurks out there just beyond the edges of our conscious mind and the ability of our human senses to know, where those we have love and lost continue to exist? What is reality and what is madness? This world premiere production is inspired by these ideas and questions. The performances, the acting and action of the opera, will be naturalistic. The audience will see and come to know complex people dealing with extraordinary need and desperation. But the world these people inhabit will be seen through Myra's eyes. 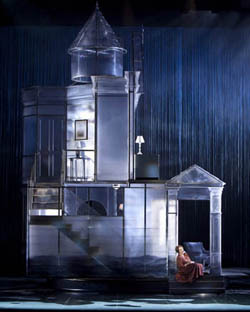 Her dilapidated Victorian house and all of the locations in the play are realistic, architectural structures, but are made of filmy transparent materials. It is as if the natural world is not really there, that at any moment it could evaporate revealing a truer world beyond, the world of spirits. A constant rain will surround the diaphanous structures of the set. The rain of our production, the rain of not only one wet afternoon but of an entire life, is envisioned by set designer Heidi Ettinger as curtains of black chains. The characters live in a world enclosed in chains. These chains are both metaphorical and literal; they are the rain, but they are also the veil between the human world and the spiritual, the thing we strive to but can never quite see beyond. They are also the porous boundary between sanity and madness. And they are actual chains, the prison of Myra's life that she needs so desperately escape, no matter what the cost. It is my hope that the production will be ghostly and mysterious, psychological and chilling and that we will come to know the characters on a deep and human level, as we watch them portrayed by brilliant singers.